Great news for American Express Cardholders in Canada who like to transfer their Membership Rewards Points to Etihad Airways' Guest program! Right now you'll get a 25% bonus on all transfers until March 11th. 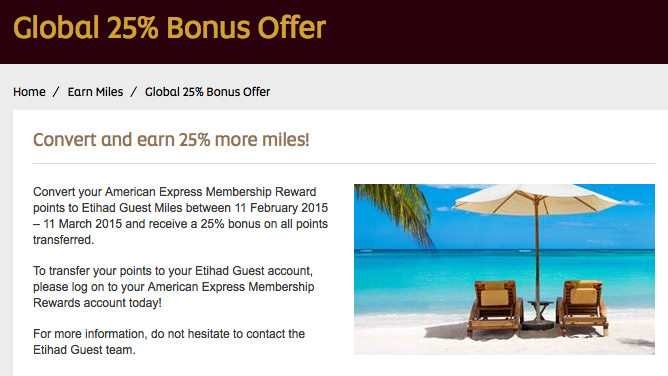 This appears to be a promotion from Etihad Guest not Amex as you won't find any details on Amex's website about the offer. Offer valid only for Etihad Guest members in; Australia, Belgium, Canada, Germany, France, Bahrain, Great Britain, Korea, Saudi Arabia, ICC/IDC, India.